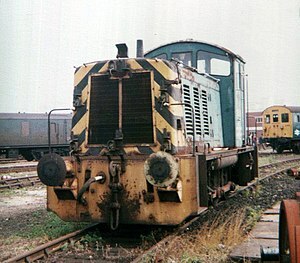 D2991 at Eastleigh Works in the 1970s. Still in service at the Works in 2008. The British Rail Class 07 diesel locomotive is an off-centre cab dock shunter. They were used in Southampton Docks, to replace SR USA Class steam locomotives. It is a 0-6-0 diesel-electric shunter built by Ruston & Hornsby in 1962. They were originally numbered D2985-D2998 and later given the TOPS numbers 07001(D2985)-07013(D2997), D2998. This page was last changed on 27 August 2013, at 01:57.